Four unauthorized cubesats apparently launched atop this Indian Polar Satellite Launch Vehicle rocket in January 2018, according to the U.S. Federal Communications Commission. Concerns about space junk and satellite-launch regulations are swirling after the Federal Communications Commission (FCC) alleged that a U.S. company launched four tiny satellites without permission. 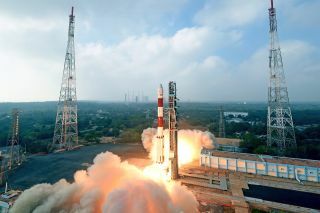 As first reported in IEEE Spectrum, four miniature satellites called SpaceBee-1, 2, 3, and 4 launched to orbit from India aboard a Polar Satellite Launch Vehicle (PSLV) rocket in January, along with several dozen other cubesats and an Indian Earth-observing spacecraft. The FCC declined to comment for IEEE Spectrum's article, and the publication stated that Swarm Technologies did not respond to interview requests. But launch-services provider Spaceflight Industries confirmed to SpaceNews that it integrated the SpaceBees onto the PSLV for Swarm. Spaceflight Industries representatives told SpaceNews that the responsibility for getting the necessary FCC approvals lies with a satellites' developer. "I always assumed that people wouldn't launch something if they couldn't" get those approvals, Curt Blake, president of Spaceflight Industries' launch services group, told SpaceNews. "I thought that would be sort of a self-regulation function." On March 7, IEEE Spectrum reported, the FCC sent a letter to Swarm Technologies setting aside a grant to expand Swarm's satellite program, pending further review. The reason: "to permit assessment of the impact of the applicant's apparent unauthorized launch and operation of four satellites," according to the letter. Swarm Technologies is operating in stealth mode; its website reveals little information about the company's plans. The one-page site simply states that Swarm will offer "the world's smallest two-way communication satellites." Some more data is available via Swarm's FCC application for the launch. There, the company said the goal of the SpaceBee mission is "a technology demo for two-way communications satellites, data relay and a new attitude-control system." The target altitude was 360 miles (580 kilometers) — roughly 1.5 times that of the International Space Station, which orbits at an average height of 250 miles (400 km). But the SpaceBees will sink closer to Earth over time, dragged down by the planet's atmosphere, the application noted. After the satellites' operational phase, they will likely remain in orbit for anywhere from 4.4 to nine years, depending on the final orbit of the satellites and the influence of the sun on Earth's atmosphere. "The ability of operational spacecraft to reliably assess the need for and plan effective collision-avoidance maneuvers will be reduced or eliminated," the FCC wrote. "Accordingly, we cannot conclude that a grant of this application is in the public interest." Swarm apparently aims to offer a satellite network for the "Internet of Things" (IoT), the universe of devices that are connected to the web. The IoT includes not only computers, tablets and phones, but also connected everyday devices such as refrigerators and thermostats. The U.S. National Science Foundation (NSF) awarded $220,463 to Swarm for an IoT satellite network under the foundation's Small Business Innovation Research program in 2017, according to the NSF website. "The proposed project addresses the problem that there are no existing low-cost options for sensing, transmitting and connecting devices from remote locations with no cell or Wi-Fi coverage," read the abstract attached to Swarm's proposal. Under the company's proposal, Swarm said, "Scientific, shipping, tracking, automotive, agriculture, energy, medical, educational and other commercial entities will have the ability to return their data from anywhere on the planet to support tracking, safe operations, and optimal and timely decision making." After the rejection of the mini-satellite proposal, Swarm sent additional applications to the FCC, including one proposal for four larger cubesats (which would launch on a Rocket Lab rocket from New Zealand in April) and a second asking to construct ground stations. Swarm, which is based in Menlo Park, California, is led by Sara Spangelo, a former worker at NASA's Jet Propulsion Laboratory who then joined Google, IEEE Spectrum reported. The publication added that Benjamin Longmier, Swarm's chief financial officer, co-founded Apollo Fusion (a company that develops electric propulsion for satellites) and a balloon company called Aether Industries, which was eventually sold to Apple.